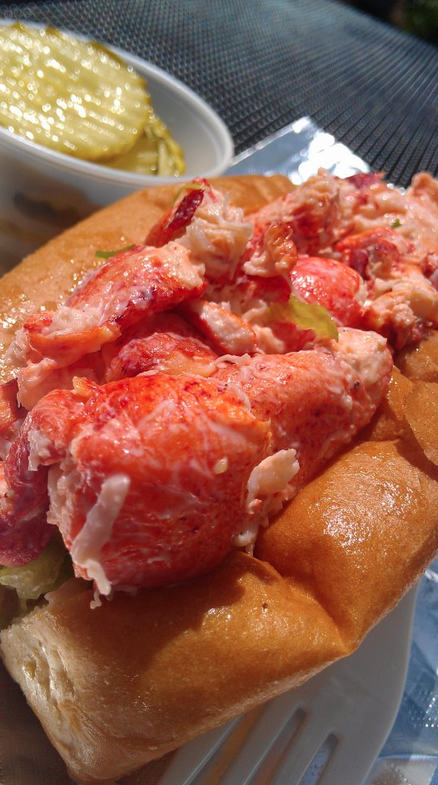 We do have a couple of rules on our quest to find the best lobster roll. Included in these are things like “no chain restaurants” (although we did eventually visit Jasper White’s Summer Shack), and “no foreign objects” (i.e. no apples, avocados, or any other nonsense – and especially no celery!). So when we found ourselves on a bike ride through Pickering Wharf in Salem, MA, we were disappointed to see that Finz, a well-known seafood restaurant right on the water, included celery in their rolls. Sorry Finz, you were instantly disqualified. So, standing there, outside of Finz, we did a web search on “Salem’s Best Lobster Roll” and, much to our surprise, a little sandwich shop right in front of us was rated by many locals as the best roll in town. The Hungry Whale is basically a sandwich shop. There is no wait service, and we were pleased to grab an outdoor table on a beautiful sunny day. We really didn’t know what to expect, but were very pleasantly surprised! The Whale’s roll is a buttery, toasted brioche. Their lobster meat was very fresh and clean, dressed with a bit of mayo, a dash of salt and pepper, and “a squeeze of fresh citrus,” and was resting on a bed of shredded lettuce. The homemade Raspberry Lime Rickeys were as good as Bartley’s, and were a real bonus! Granted, we had been on a long bike ride so we were definitely hungry, but we found ourselves repeating to one another, “This is a really good lobster roll,” as if surprised that this small sandwich shop could hold up to some of the big boys. The Whale also has some specialty lobster roll-type concoctions, included the “Lobster Dog” (yes, a grilled hot dog covered in fresh lobster meat), and the “Monster Lobster Roll,” which is the biggest roll we’ve seen. 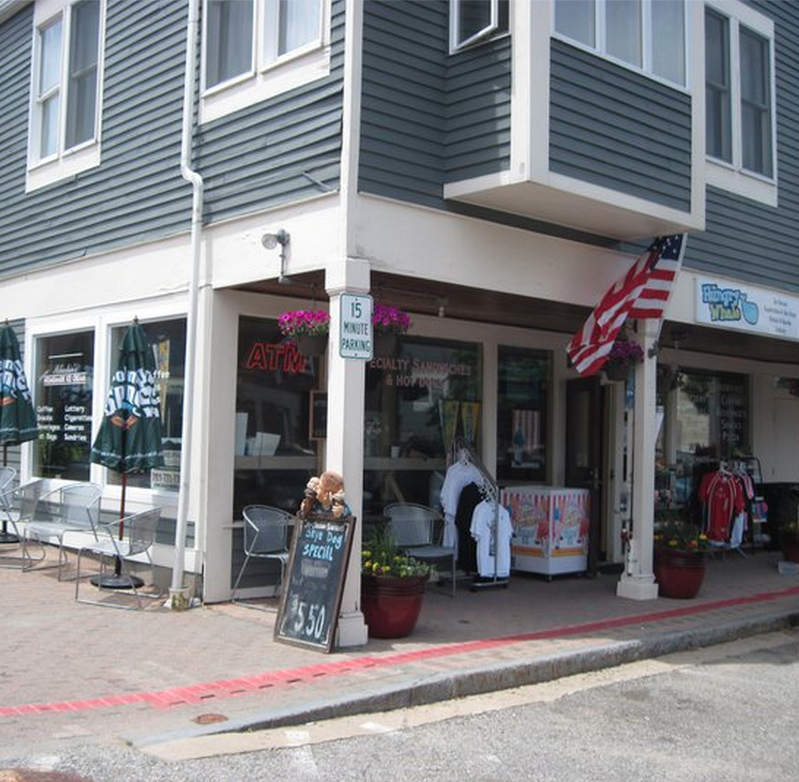 The Hungry Whale is located at 72 Wharf Street, Pickering Wharf in Salem, MA (right across from Finz!). WEBSITE: http://hungrywhalesalem.com. FACEBOOK: https://www.facebook.com/thehungrywhale. PHONE: 978.745.6659. We borrowed these snaps from The Hungry Whale’s Facebook page. We’ll be happy to remove the images upon request. you never put celery in a lobster roll…….that’s like putting tomatoes in clam chowder in ne..you could be strung up for that!!! Dan, you are right! Well, mostly. IF you feel you MUST add celery, we suggest you consider substituting some finely diced cucumber instead. We find that the texture and subtle flavor of the cuke is much more in keeping with the characteristics of lobster meat. Given the choice, though, we would add neither. And, needless to say, you are spot on regarding the blasphemy of supposed “Manhattan Clam Chowder!” Totally bogus.